we implement various performance inspections. after installing the cable assembly to industrial equipment. 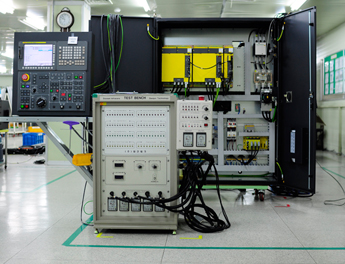 You may have infinite reliability to your cables and equipment by DAEGUN's performance inspection. DAEGUN TECHNOLOGY checks the quality with various methods. After producer’s initial inspection, visual inspection, and microscope inspection, total 5 different inspections, the final inspection is cable efficiency test. At the final stage of inspection, one more visual inspection and compare with the blueprint, it reduces the noticeable occurrence of faulty. It inspects the parts which eyes cannot confirm by naked eye. Confirm connecting part, soldering part after processing, and compress statue of connector and cable. It is a tool machine control box inspection machine, inspection for the each tool machine control box in order to secure quality and reliability. Inspection Main Item : Inspect lateral force measurement (Relay, solenoid, break, etc. ), short, wiring mistake, wiring pendency, and assembling mistake. Divided into large specification test, test operation, function testing, inspection option, for each item of each detail inspection, performance testing of industrial equipment, strict inspection is done set criteria. Items in process inspection, test, such as about 100 different, SETUP2, Cover wiring mechanism, SETUP1 in particular.